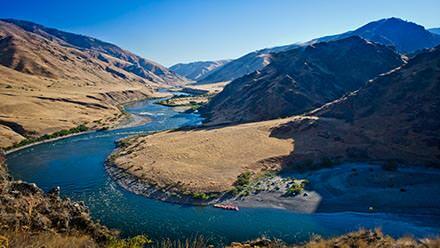 The Snake River in Hells Canyon rafting trip begins in Cambridge, Idaho and ends in Lewiston, Idaho. There are several ways to do this (1) Fly directly to Boise, Idaho (BOI), the Harlow's Transportation Service van provided by ROW Adventures will meet you outside the baggage claim doors in the taxi lane for an easy two-hour drive to Cambridge. (2) Fly to Boise, rent a car, drive 2 hours to Cambridge, Idaho. (3) Arrive in your own car - which can be shuttled for a fee to Lewiston, Idaho (your final destination). Be sure to arrive in Cambridge in time for the 8:00 pm orientation meeting at the Frontier Lodge the night prior to your trip departure date. Once the river trip is complete, it is recommended to stay that night in Lewiston for logistical reasons mostly. Included in the cost of your trip is a special farewell dinner with the guides served at the Red Lion Hotel in Lewiston. Travel from your home to Cambridge, Idaho and meet ROW's Team Leader at the Frontier Motel at 8:00 PM Mountain Standard Time (MST) for a one-hour orientation meeting to answer last-minute questions. You'll also receive your waterproof gear bags. Dinner on your own. 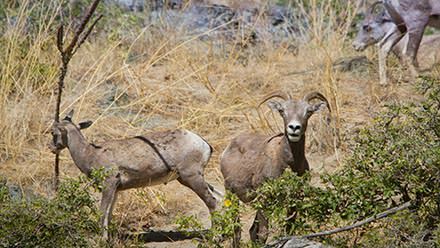 The team leader will meet you at 7:30 AM at the Frontier Motel, where a two hour bus ride will bring you to to the launch point at Hell's Canyon Dam. Enjoy a breakfast stop hosted by the trip outfitter, ROW Adventures. A safety orientation will prepare you for the trip while your gear is loaded onto the boats. You'll be ready to paddle with your group in a paddle raft or ride in an oar-powered raft. Freshly brewed coffee greets your senses at about 7 am, with breakfast following a short time thereafter. Personal gear, tents and kitchen gear is loaded back on the boats and readied for a day filled with rapids, settler's cabins, and incredible mountain scenery. A rare view of the Snake River and Hell's Canyon is a reward for those choosing to hike the trail to "Suicide Point". 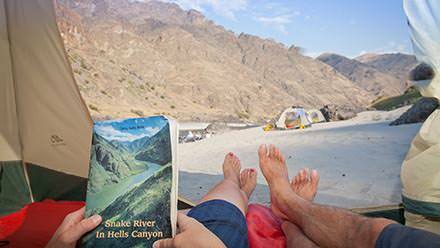 You'll welcome a splash in the river as you return to the boats and float downstream to more scenic and historic sites--including the historic Kirkwood Ranch. Each day on the Snake River offers something a little different from the day before. Rapids, scenery that lifts the eye and heart upwards where raptors of various kinds soar over historic homesteads. The human history in Hell's Canyon is just as dramatic as the canyon walls. 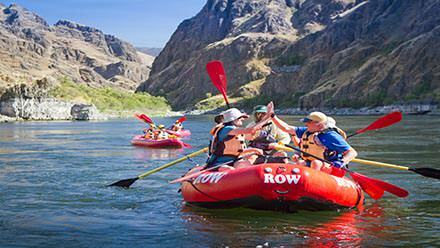 The trip will end near 5 pm and you'll enjoy a hot shower at the Red Lion Hotel in Lewiston before meeting the guides and group for a farewell dinner hosted by ROW. This is a sample five-day itinerary. Four-day trips in June, when the water is high, cover the same mileage as the five-day trips. While this is a typical itinerary, every trip is unique. This is meant to give you a snapshot of the trip and examples of the things you'll see and do, but should not be considered an exact itinerary. 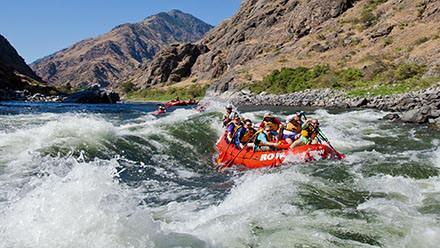 There are many travel options to consider in planning your Idaho rafting vacation. Simply give us a call and we'll discuss your options and help arrange everything for you. 1 - Fly directly to Boise, Idaho (BOI), the Harlow's Transportation Service van provided by ROW Adventures will meet you outside the baggage claim doors at 4:30 pm in the taxi lane for an easy two-hour drive to Cambridge. 2 - Fly to Boise, rent a car, drive 2 hours to Cambridge, Idaho. 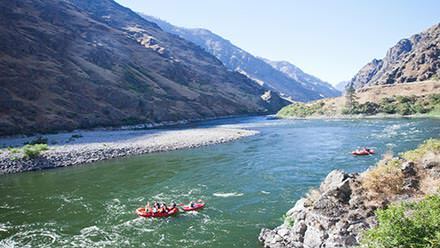 3 - Drive personal vehicle directly to Cambridge, Idaho to be shuttled to Lewiston for a fee while you are on your river adventure. For your convenience, pre trip lodging can be booked for you at the Frontier Motel in Cambridge for $99+tax per room/night. Post trip lodging can be booked for you at the Red Lion Hotel in Lewiston for $110+tax per room/night. For more than 2 guests per room, there is an additional $10+tax fee. The Red Lion offers free airport shuttle service to the Lewiston Airport (LWS). Please arrange your shuttle by calling the Red Lion Hotel at (208) 799-1000. The Spokane, Washington Int’l Airport (GEG) is also an option just 1.5 hours from Lewiston. If you drove to Cambridge and had your car shuttled north, it's waiting for you at the hotel. If you're flying, the Red Lion offers free airport service from the Lewiston-Nez Perce County (LWS) Airport, Idaho from 8:00am to 9:00pm. Contact the Red Lion Hotel at (208) 799-1000 to set up your complimentary shuttle. Otherwise, taxi service is available to the Lewiston Airport at a reasonable rate. If you are flying out of Spokane, WA, you can take a taxi two hours north to the Spokane (GEG) Airport.